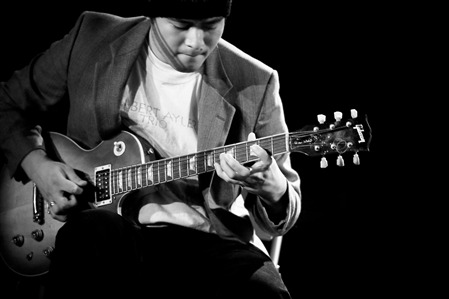 Filipino-American guitarist Karl Evangelista ranks among a new wave of creative musicians grounded in jazz, 20th century experimentalism, and popular song. Joined by an all-star grouping of Bay Area experimentalists, Evangelista explores a spectrum of folk melodies and brand new compositions, venturing into the meeting point between ecstatic song and the dark outer reaches of noise, psychedelia, and free jazz. Signal to Noise magazine hails guitarist/composer Karl Evangelista as "one of the most original instrumentalists and composers of his generation," and as the creative force behind his band Grex, he has been called "essential current-and-future listening" by Tiny Mix Tapes. Evangelista has explored the possibilities of intercultural dialogues across a vast spectrum of academic and professional situations, working in a wide variety of ensembles under the direction of, among others, Fred Frith, Oliver Lake, Muhal Richard Abrams, Scott Amendola, Eddie Gale, Steve Berlin, and Asian Improv aRts members Francis Wong and Jon Jang.